a brief summary of the ELMP P30HD camera. NOTE: Not all rooms have a document camera. Other rooms may have different models, however, they function very similarly. 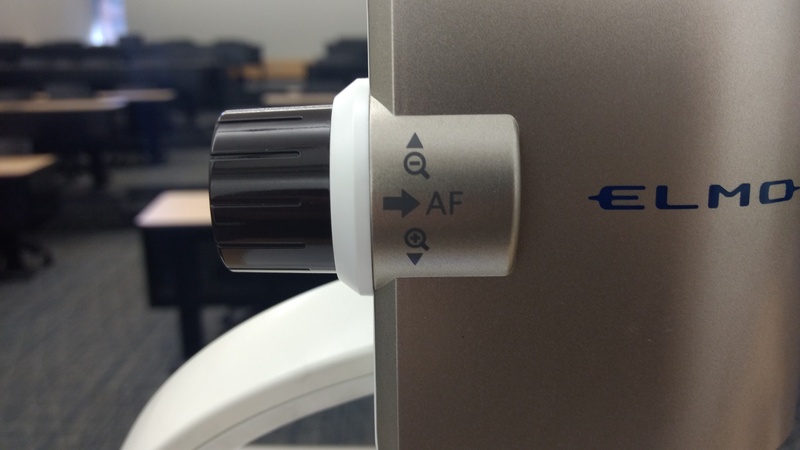 Turn on the projector using the teaching desk's control panel and select "document camera". Turn on the document camera itself by pressing the power button on the upper right-hand side. Once powered, it should illuminate blue. You should now be able to see the document camera showing content on the screen. To zoom in and out, use the knob on the side of the camera. It will auto-focus automatically. 5. To turn on the light, press the lightbulb icon to the right of the display. 6. Turn the device off my pressing the power button for 4 seconds. Once powered off, it will illuminate red. 7. Turn off the teaching station.